Adaptil Refill 48ml (30 days). Previously known as the DAP Refill (or Dog Appeasing Pheromone refill). Reduces stress, anxiety and associated anti-social behaviour in all breeds of dogs. Dog Appeasing Pheromone helps dogs overcome fears and stress and ease the fear of travel. Dogs are social animals and can suffer from separation anxiety resulting in undesirable behaviours which manifests itself as restlessness, excessive whining and barking and adult destructive chewing and house soiling. The DAP refill (Dog Appeasing Pheromone) mimics the properties of the natural pheromones of the lactating female. By replicating this signal of comfort, DAP helps alleviate fear and stress related signs in the puppy and adult dog. D.A.P. has no smell and is odourless to humans when dry. I have one of the Adaptil diffusers on the go all of the time for my nervy German Shepherd, if we go away, we take it with us + since it has become a permanent thing, she seems much calmer and chilled and her nervous tummy seems much better as well - I think it is great + would definately recommend giving them a go! I have nervous old dog and thought i would try adaptil, it didn't work at all with him, in fact it seemed to make him worse. 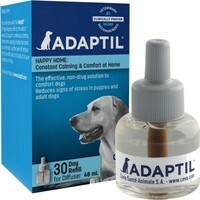 I have used adaptil for the past 2 years now to help my dog cope with Fireworks. While I belive adaptil makes a differance to her over all anxity she would still react to the lound ones. Whilst I am glad that Adaptil works wonders for some dogs, it is not a quick fix for all dogs. There was absolutely no noticeable change in the behaviour or level of anxiety suffered by my rescued Staffy X who has separation issues and the only way I've been able to help her is through sheer hard work and lots of advice from a local obedience trainer who has lots of experience in dog psychology. Sometimes there is no easy option but its definitely worth a try!! Our rescued Greyhound was like a different dog on the first night we used Adaptil. Really helpful for our collie x who is terrified of the low-flying RAF jets we have in this area. We have been able to use a Adaptil diffuser to make her a "safe" hide-a-way, which she now runs to when a jet flies over rather than tearing round the house trying to find a safe spot. Adaptil product is excellent for anyone with a dog who gets frightened of fireworks, we used it last year with our staff who is normally a nervous wreck at this time of year and had previously had valium which made him unwell. It worked!!! We were amazed at how calm he was with no side effects at all. The price and service on this site is also excellent, half the price of the Adaptil at our vets.